Guwahati: Two decades after they began, Naga peace talks were held in Nagaland for the first time on Monday between the Centre and six rebel outfits in a bid to find a final solution to the six-decade old issue. Chief interlocutor and Prime Minister Narendra Modi’s envoy, R N Ravi led the team from the Centre. The six outfits, who come under the umbrella of Naga National Political Groups (NNPG) are GPRN/NSCN (Kitovi Zhimomi), Naga Nationalist Council (NNC), Federal Government of Nagaland (FGN), NSCN (Reformation), National Peoples Government of Nagaland (Non-Accord) and NNC/GDRN/NA (Government Democratic Republic of Nagaland-Non Accord). This is the first time talks are being held with outfits other than the National Socialist Council of Nagaland (Isak-Muivah) (NSCN-IM), with whom the Centre signed a framework agreement in 2015. Among other things, Naga outfits, who were earlier seeking a sovereign state, have now been demanding greater autonomy for the Naga people and integration of Naga-inhabited areas in the region under Greater Nagalim. The talks were held behind closed doors in Chumukedima after a public reception was accorded to Ravi on his arrival in Dimapur around noon. “People in Nagaland are happy that the peace talks are being taken to another level and discussions are being held in our soil. Inclusion of six new groups in the process is a positive development,” Theja Therieh of Nagaland Tribes Council (NTC) told HT. Since this is the first time the talks are being held with the six groups, Monday’s discussions focused mainly on the principal issues without delving much into the specifics. 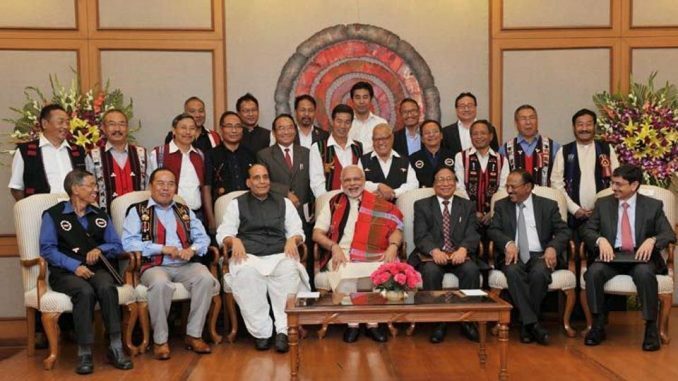 In the framework agreement (details of which are yet to be made public), the Centre had accepted “uniqueness of Naga history and culture” and the NSCN(IM) had agreed on “primacy of the Indian constitution”. There is still uncertainty on the issue of Greater Nagalim. Assam, Arunachal Pradesh and Mizoram — states which have Naga-inhabited areas — have opposed giving away their territory for the Naga cause. Peace talks with NSCN(IM) started in 1997, with the first rounds being held outside the country, in places like Thailand and Netherlands. The outfit’s leaders, late Isak Chisi Swu and Thuingaleng Muivah started deliberations in India in 2002. Over the years, there have been close to 80 rounds of talks leading to signing of the framework agreement in 2015. The final accord on Naga issue will be signed on the basis of the agreement. While there are speculations in Nagaland that the final solution could happen within this year, there is no certainty of that. “The issue has continued for so many decades and it won’t be possible to put a time limit on the final solution. All Nagas hope that the solution is acceptable and honourable,” said Therieh.